Whether you are trying to mobilize people into mission or thinking through a challenging mission issue, you need insight. Increasingly our culture is gaining valuable insights from visual presentations of data (infographics). We are committed to bringing you insightful data to help you make Spirit-led decisions. Missiographics brings mission data and powerful visuals together in a dynamic combination. Missiographics are available for you online and in the following digital formats: pdf, png/jpg. It is harder than ever to break through the clutter of information. We need new tools to communicate effectively. Infographics are one of those tools. Did you know an infographic is 30 times more likely to be interacted with than an article? By presenting data visually, you allow more data to be presented more quickly with greater impact! Infographics are an amazing tool to engage your various audiences about key information that is impacting your ministry. Infographics are being used for awareness, fundraising and strategic planning. Missiographics 1.0 is a sweeping visual narrative that draws you into the realities of our world and God’s global Church. With short visually designed chapters, each infographic is accompanied by analysis to help you understand the issue and engage others with it. 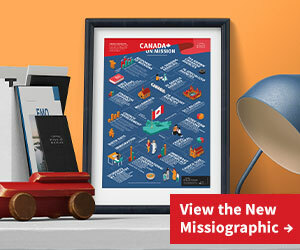 Missiographics 2.0 uses stunning graphics to illustrate the best available data on the spread of the gospel, and veteran missiologist and researcher Gilles Gravelle fills in the gaps with a detailed text that teases out the implications of the trends that are changing our world. Digital and printed versions (limited stock) of both books are available. If interested contact mvanhuis@missionexus.org.